Last Saturday I was at the launch of The Starlings and Other Stories at Waterstones in Wrexham. Nine of the twelve authors were there along with David Wilson, the photographer whose work inspired our stories. I did wonder if we would outnumber the audience (it’s been known to happen with smaller groups of writers than this! ), but there was a good turn-out and the audience was responsive. It is rare that publication of a collection of short stories is marked in this way, but truly there is something special about this book. I don’t know of any other that combines images and texts in quite this way. These aren’t illustrations: as I’ve explained in an earlier blog, the photographs came first. And what photographs! As Chris Simms writes in the introduction ‘these weren’t the cosy compositions of tourist shop tea-towels. By his own admission David’s photographs – beautiful as they are – often carry “a sense of eerie foreboding.” Brooding woods emerge from pale mist. Lonely farmsteads are threatened by stormy skies. An abandoned building leaves you wondering what happened to those who once lived there.’ Perfect starting points for a crime-writer and it was fascinating to see what everyone had made of it. It was lovely to meet the team at Graffeg who are responsible for a beautifully produced book along with the other writers, and – especially – David Wilson. 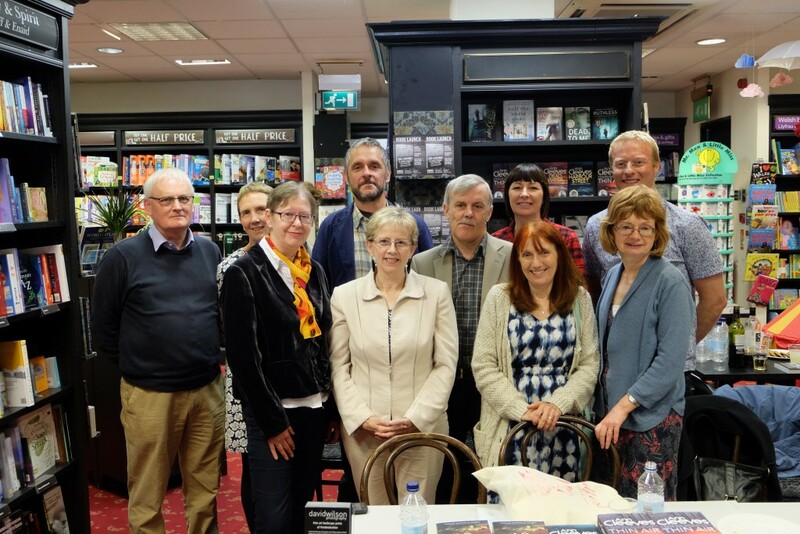 The photograph shows from left to right in the front row, myself, Margaret Murphy, Kate Ellis, Helena Edwards; in the second row Toby Forward, Ann Cleeves, David Wilson, Martin Edwards, Cath Staincliffe, Chris Simms.